The President of the Living Faith Church Worldwide, aka. Winners” Chapel with headquarters in Ota South West of Nigeria said, governments must recognize that people matter. Also speaking on the significance of the church, he said, the church is the light and salt of the world and ordained to set the pace for development in all aspects of human endeavor. This was at the dedication of a multi-million naira auditorium built by the Fountain of Life Church at the Industrial Estate of Ilupeju, in Lagos State, South West Nigeria on Saturday, 28th June 2014. Among dignitaries at the event were the Lagos State Governor, Mr.Babatunde Raji Fashola [SAN] and the Minister of Communications Technology of the Federal Republic of Nigeria, Mrs. Omobola Johnson whose birthdays were 28th of June, the dedication day. 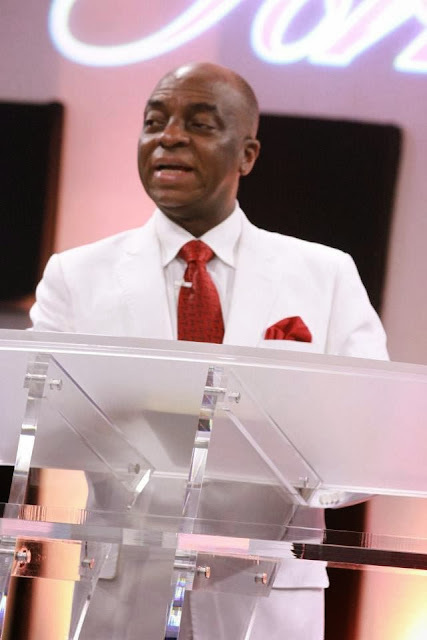 Bishop David Oyedepo said, “Authority only has value when it is adding value. The government must recognize that people matter. We gave them the charge, not they us. Those in government are responsible to and for the people. That’s what democracy is all about under whatever definition. This is what I call “demoncazy”…demonstration of demons. The church is a huge constituency across Nigeria. We are the one who marks not you. Every student believes s/he has done well in an examination. However, it is the teacher who should decide and not the student. Lto R. Their Excellencies Governor Babatunde Fashola and his wife and Pastor Taiwo Odukoya and his wife. In a special report published in the Guardian newspaper of Saturday, June 28, 2014 regarding the information management of the Federal Government of Nigeria over the adduction of the Chibok school girls in April 14 by the terrorist Boko Haram Islamic militants Mr. Yemi Fakayejo, journalist, lawyer and Public Relations professional with more than 27 years media experience said, “Information Management is more than responding with caustic insinuations…President Jonathan should ask the questions that those who mandated him through their votes would ask…He always speaks defensively. He should be more forthright, posture as the man –in-charge and give Nigerians hope. It is extremely defensive,…more importantly, it does not resonate with the stakeholders….people like to know what is happening …it is because everything is treated first on the altar of politics and what is in it for me? As Iraq losses control of Syrian and Jordanian borders to Sunni insurgency led by ISIL and al Qaeda offshoot, the United States Secretary of State, John Kerry met Iraq’s prime minister in Bagdad Monday, June 23, 2014 to push for more inclusive leadership, as Nuri al-Maliki’s forces abandoned the border with Jordan,leaving the entire Western frontier beyond government control. However, the crisis is taking a new turn as the ISIL on Sunday [29/6/2014] announced it was establishing a “Caliphate”-an Islamic form of government last seen under the Ottoman Empire-extending from Aleppo in Northern Syria to Diyala in Iraq, the regions where ISIL has fought against the regimes in power. According to the Agence France Presse [AFP], in an audio recording distributed online, ISIL declared its chief Abu Bakre al-Baghdadi “the Caliph” and “Leader for Muslims everywhere”. This may mark a new era in Jihadism. Bishop David Oyedepo who is an architect described the auditorium as an “edfice of global standard”, emphasing that “, we are largely not associated with excellence. Excellence, he explained is a product of tireless commitment to a task. The church, Bishop David Oyedepo said, is a center for unveiling the way things are done. The church is ordained to be like a school where divine principles are used to enlighten the dark world and push darkness away. Therefore, it is not time the church needs but timely action. The church also needs humility and the learner’s attitude and being thankful for every grace experienced. Referring to this “church flow” , Evangelist Reinhard Bonnke, founder of and leader of all Nations, an international evangelistic ministry with headquarter in Frankfurt, Germany in his book, “Evangelism by Fire” said,”We did not have this harvest because we were superior to those precious men and women, but only because the harvest season had arrived. …Knowing that so much already was done, long before we ever arrived on the scene, should keep us humble in times of success”.